what color walls. They are lovely. Thank you for sharing. Do you know if it's the heartwood or country insert? So many details, but this is perfection. :) Thanks. gas fireplace - Really beautiful. Could you please tell me what brand gas fireplace that is and the dimensions and model? Trying to find something like this and having a hard time with correct dimensions. Thank you in advance. Im also interested to know where it came from. If this is a gas fireplace is there a screen in front? I like that it looks like a real wood burning fireplace. Do you have specific brand/name of gas fireplace and where you can order? Lovely. No, there is not a screen. This unit is made by Town and Country. Their website should have additional information regarding where/how to order. Where did you purchase the counter stools? They were purchased by Susan Marinello Interiors in Seattle. Color - What color are the kitchen cabinets? So beautiful. Could you please tell me; is the trim in the living room Cloud White as well (Semi-gloss)? Also, what color are the ceilings and did you use an eggshell finish there? Thank you kindly. Correct, the trim is the same color in a semi-gloss finish. The ceilings are 1/4 the tint of the wall color in a flat finish. 1 - Can you please tell me the width of the mantel legs and the height of the wood piece just above the granite? (Are they the same measurement?) 2 - How thick is the actual mantel piece including the small piece of molding just below it? 3 - What is the length of the mantel and the height from floor to mantel shelf? Thank you. COASTROAD- The most helpful comment on all of HOUZZ! Thank you! what are the dimensions of the shown part? Is this picture's shown area 20' by 27'? can you provide details on the island chairs? Couch - Can I get the brand and color o the couch please? Mantel - Hi! What color is on the mantel? Benjamin Moore's Mayonnaise is a similar color. where did you get the flush mount lights? thanks...what are these specific lights called please? what color/brand are the floors? Custom mixed color. White Oak dyed and stained. What ratio colors did you use? what shop is th sofa from, I cant find a nice comfortable trendy sofa in any shop. they are all hard and cold.!!! Contact Susan Marinello Interiors in Seattle. I believe custom made. Kitchen is approx 12'x19' and the island 5'x9'. Breakfast room/table - Has the island replaced the breakfast table or is there one I cannot see. I ask because I am planning to build an kitchen island in the breakfast area just beyond the imaginary border of the kitchen. Any advice? For this project, we did not design a breakfast nook area. This home has the eat-in kitchen island and a separate dining room space. This is the Bella pendant by Jeremy Pyles. where did you place the cable box? It is to the right of the fireplace, just barely cut out of this photo. If you look through the family room photos of this project, you will find one that shows the built in cabinet housing that equipment. This was sourced by Susan Marinello Interiors, I unfortunately do not have that information. The TV is mounted 4'3" high. The couch is approx 9' from the fireplace. Fabric on the couch? Where is the Rug from? - I'd like to know what the fabric is on the couch & the color. I would also like to know about the rug - where is it from & the exact name. Thanks! This couch was custom made by the interior designer, Susan Marinello. I'm unsure of the fabric specifications. Backsplash is a Capriccio Earthenware cut tile from Ann Sacks. Width - Paul, what was the width of the kitchen & family room combined? Any chance you have the measurement, Paul? It is a three piece cove molding with a detail on top and bottom. Start with a 5" cove and build up from there. What brand of fireplace is this? Agreed. The Fireplace is beautiful. Guess they couldn't figure out another place to put the Big Screen. What a shame. 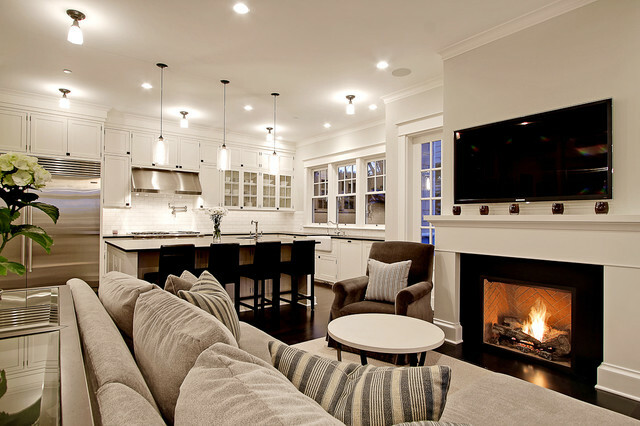 What material did you use around the 2 fireplaces in this home? It's so dark in the photo, really hard to tell. Maybe black marble or granite? How tall are the ceilings in this house? I am struggling to decide between 9ft and 10 ft ceilings. I love the comfortable yet clean feeling this home projects. Do you think its ceiling height helps project that feeling? Thank you. 10'. 10' Is a great look for having windows above exterior doors and it feels "grand". My personal feeling is that 9' is more intimate. BM 954 or 955. Good luck! Could you please tell me the dimensions of the den? Forgot to ask...What is the color on the cabinets? Is it the same as the wall color-B.Moore OC-140? Thanks so much! I love this kitchen!! Can you please tell me the color and maker of the subway tile on the backsplash? I am having the hardest time finding one and I really love the way this one looks! Thanks so much for your time! Where was the sofa purchased or what brand please? Thank you! - Sofa? What brand? What colour is the trim ? - I love the colour in this room . Do you have any information on the mantel brand? Can you tell me the approx cost per foot? Thanks! Flooring - Flooring type, color, manufacturer? You are so talented as seen from all your posted work. Where is the door hardware from? Can you please tell me type of mouldings on wood fireplace surround? - I am having my mantel rebuilt in my home and I am trying to find out dimensions and moulding types used to create this simple but beautiful fireplace surround! Learner - Where can get this fireplace? If this was a newly built home, would you have recessed the TV? Grout color for backsplash - Beautiful work! I am going for a similar look in my kitchen with a classic subway and white cabinets. Curious to know the grout color used, brand and color if possible. Debating whether to use a bright white or an off- white. Thanks! What is the piece of furniture behind the sofa? - Is there a picture that has a better view of it? is that chair chocolate color and comfortable - living room chocolate couch and chair brown framing,goldest walls and one wall a dark coctail cherry red. Would love to have this chandelier! - Hi! Could you please tell what is the brand of the chandelier, where did you buy it and how much did it cosy? Many thanks in advance! What is the fabric on the couch, inckuding the color? can you tell me who makes the pendant lighting, what size they are and what the dimensions of the island are? Stunning home! What color family (grey or Tan tones) are the couches in this home? This beige brick firebox in a full herringbone pattern is striking surrounded by honed black granite. Living adjacent to kitchen area -sink with windows.